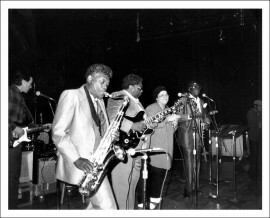 BIG JAY will tell the story of Cecil “Big Jay” McNeely, legendary saxophone “honker” and one of the last surviving Rhythm & Blues (R&B) music greats of the 1950s, as he embarks on his latest and perhaps last tour. Even today at 84, his performances are filled with power and excitement, but he lives in a small and cluttered one-bedroom apartment at the back of a house in South Los Angeles. To learn how he got here, McNeely’s remarkable personal history will be told through a combination of exciting contemporary concert footage, verité scenes with his family and friends, interviews, and rare archival footage. Big Jay came out of the African-American community of South Los Angeles and Watts in the 1930s and 1940s, where R&B was born. Jay had a #1 hit in 1951 and then started adding showier elements to his act – crawling on his back, bug eyes, a sax painted florescent red, and more. These elements led upper class Blacks to frown upon his act, seeing it as demeaning. Instead, whites and Latinos became his audience, and largely remain so to this day. But in the 1950s, the LA Police Department didn’t like the interracial mixing at his concerts and made it almost impossible for him to play in the city of Los Angeles. As R&B declined in the 1960s, he resorted to playing in strip clubs, and later to working in the post office to make ends meet. McNeely’s story will chronicle the social and cultural changes that happened in music and society as a whole in Los Angeles and the USA over the course of his career. He’s often been a man living between two worlds, black and white. That happened again in the early 1980s, when Big Jay was rediscovered — by Europeans. He started a rigorous international touring schedule, playing to large crowds in Europe, Australia and Japan. He lives as one person in the United States, little-known and underrated, and another overseas, a musical hero to thousands of fans – still moving between two worlds. Big JayWe end with Jay on tour, contrasting the slow routines of a man in his 80s with the strict discipline of a career musician. Off stage he moves with effort, and it’s hard to believe that he will be able to deliver the goods. But finally at a music festival in a glorious location, he plays a concert to a large crowd and, as always, rises to the task. Jay, ever the enthusiastic entertainer, is clearly energized and overjoyed by the delight of the fans.